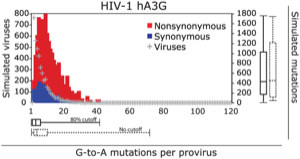 Simulation of hA3G-mediated HIV-1 evolution. HIV can only infect human cells because it has a defense against APOBECs: the viral protein “vif” causes APOBECs to be destroyed, and the virus is able to replicate without being hypermutated. So let’s say we develop an antiviral drug that blocks vif. APOBECs would drive hypermutation of the virus. This hypermutation would include the gene encoding vif. Would this mutation, in a kind of molecular judo, drive rapid evolution of vif, so that it becomes resistant to the drug? I’m not quite convinced this paper was actually modeling the phenomenon they say they’re modeling — is vif that’s shut off by deliberate mutations the same as vif that’s blocked by a (hypothetical) drug? But it’s a useful start, anyway.